More than 100 bodies including a girl believed to be one-year-old have been retrieved at the Goil Fuel Station that exploded during Wednesday’s torrential rains in Accra. The Ghana National Fire Service has confirmed that the number of dead bodies could rise as the salvage operation continues. It is, however, unclear what sparked the inferno at the Service Station behind the GCB Towers and opposite the Vienna City night club. Meanwhile, people helping the security services in the rescue operation are telling Starr News that about 96 charred bodies have been found. 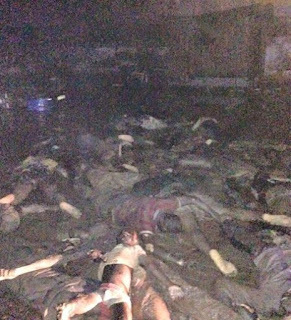 Starr News’ Asabea Akornor who is at the scene reports that the police are still counting and bringing out the victims from their respective homes around the scene of the outbreak. The inferno followed hours of heavy downpour in the capital that led to power outages in several communities. Accra is flooded following torrential rains that continued for several hours. Hundreds of workers in the capital were left stranded at their work places as the heavy downpour submerged the city.